Very little can compare to Celtic artwork. It usually features intricate knot work that is nothing short of stunning to behold. And on the Engraved Celtic Cross Bracers is a perfect example of a visually stunning piece, rendered into a Celtic cross. 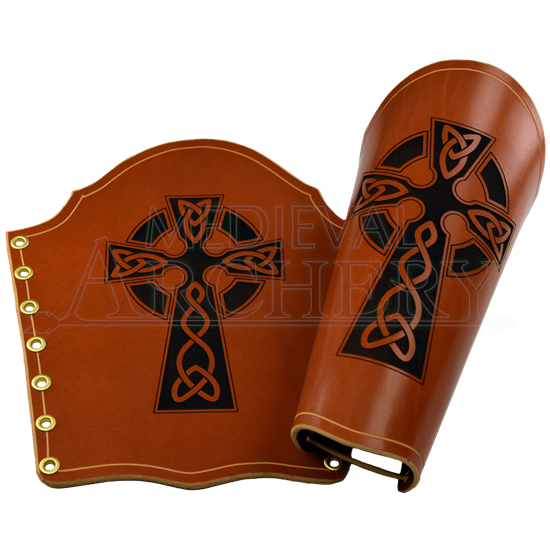 That this bracer is hand-crafted from quality leather already makes it a superb product. It is available in thick, defensible 13/15 oz. leather or in flexible 7/8 oz. leather. It is quite literally everything a good bracer should be. The Celtic cross that has been engraved into the leather is really just icing on the cake, at this point. The cross features broad, squared ends that narrow as they extend towards the center. Each arm of the cross features a simple rendition of Celtic knot work that, despite being simple, is still very tasteful and appealing. Between the arms of the cross are four curved sections of blocking, which create the illusion that a circle lays just underneath the center of this beautiful Celtic cross. Eyelets line the left and right edges of the bracer. Threading the supplied leather lace through these will enable a tight yet comfortable fit when worn. The Engraved Celtic Cross Bracers are hand-made, top-quality, and stunning to look at. Is there a downside to this item? No. There is not.